Kingdom Hearts -HD 1.5 ReMIX- , the high-definition port for the PlayStation 3 of the first Kingdom Hearts role-playing game and the Kingdom Hearts Re: Chain of Memories follow-up, will include 2 hours and 50 minutes of remastered video footage from the Kingdom Hearts 358/2 Days game. Cutscene director Masaru Oka told Famitsu that the staff created 100 new scenes for the 358/2 Days content. Famitsu is currently hosting screenshots of the remastered footage. 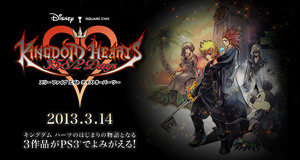 Famitsu's interview with sound designer Yuki Hirose revealed that composer Yoko Shimomura is supervising the rearranging and re-recording the songs for the 358/2 Days content with live instruments. After viewing all the 358/2 Days content, players will receive a custom theme for the PS3. The game, which includes the "Final Mix" version of the original Kingdom Hearts game, will also have trophy support. The game is slated for a March 14 release in Japan for 6,980 yen (about US$77). I want this so badly, but I want KH3 more! I loved that game, but I had no idea that Jesse McCartney did the voice for Roxas; I thought it was some kid. I'm just... you kearn something new everyday.